Research from the Yale School of Public Health found that had Pence responded in 2013 to the HIV epidemic in Scott County, Indiana, the number of HIV infections could have been lowered from 215 to 56 or fewer over the course of 2011 to 2015. In his 2019 State of the Union speech, President Donald Trump will reportedly call for an end to the United States’s HIV outbreak by 2030. This is a surprising announcement, given Vice President Mike Pence’s checkered past on this issue and the Trump administration’s own significant rollbacks in sexual and reproductive health policy. Approximately 40,000 people in the United States are diagnosed with HIV each year, two-thirds of whom are gay and bisexual men and 43 percent of whom are Black. Injection drug use is a significant risk factor for HIV transmission as well. Homophobia, drug use stigma, racism, and financial instability contribute to the disease’s proliferation. The question, then, is how the administration will seek to improve HIV treatment and prevention, an issue on which Pence and Trump have both historically fumbled. Then-Gov. Pence’s notorious mishandling of an HIV epidemic in Scott County, Indiana, stands out as a striking failure to address this public health problem. Amid public health spending cuts, including state Republicans’ efforts to defund Planned Parenthood, Scott County’s lone Planned Parenthood clinic—and lone HIV testing center—closed in 2013. With injection drug use a pervasive problem in the region, and with residents sharing needles (a significant risk factor for spread of HIV), 215 people in Scott County were diagnosed with HIV. Pence had opposed needle exchange programs based on the concern that it would spark more drug abuse, despite evidence showing that access to clean syringes is associated with decreased incidence of HIV. It was not until March 2015 that Pence ultimately came around to favoring a needle exchange program, but only after dragging his feet and praying on the issue rather than acting in the face of crisis. Research from the Yale School of Public Health found that had Pence responded in 2013, the number of HIV infections could have been lowered from 215 to 56 or fewer over the course of 2011 to 2015. Even when “dragged kicking and screaming” (as one Indiana Democrat put it) to permit the needle exchange in Scott County, Pence continued his broader opposition to needle exchange programs, saying, “I am opposed to needle exchange as anti-drug policy.” He also required that counties seek permission to adopt such programs. The crisis in Scott County also reflects the consequences of Republicans targeting Planned Parenthood for spending cuts. As a member of Congress, Mike Pence emphasized a “pro-life” agenda and introduced the first bill to defund Planned Parenthood in 2007, and he continued to seek to advance this policy through 2011, when the House of Representatives passed his amendment. While support for Planned Parenthood is often entangled with partisan debates over abortion policy, the broad range of health services offered at its clinics—including contraception, sexually transmitted infection testing and treatment, and LGBTQ services—suggests that limiting clinic access has farther-reaching effects on public health, as conservative actions brought to light in Scott County. Indeed, Planned Parenthood clinics report providing more than 700,000 HIV tests annually, with research finding that HIV testing to detect the disease earlier may lead to lower rates of HIV transmission. I examined the public health impact of Planned Parenthood access across the 50 states from 2008 to 2015. Using data from the Centers for Disease Control and Prevention and controlling for such factors as the uninsured rate, Medicaid expenditures, and the poverty rate, I find that a higher number of Planned Parenthood clinics per capita is associated with dramatically lower rates of teen births and STIs—specifically HIV diagnoses. This makes it all the more striking that in the name of “protecting life,” Pence and the broader Trump administration have remained so fervently committed to reducing if not eliminating government support for Planned Parenthood. Pence’s opposition to Planned Parenthood was part of a broader pattern of health-care cuts in Indiana, where he signed legislation that slashed public health funding despite many pressing problems in the state. The Trump administration likewise has advocated for Affordable Care Act (ACA) repeal legislation that would reduce coverage and increase costs for millions of people including those with preexisting conditions such as HIV. The Congressional Budget Office projected that the Republicans’ legislation would result in dramatic cuts to Medicaid, the largest single source of health coverage for those living with HIV in the United States. Were the administration more successful in championing its preferred health policy changes, those living with HIV would have returned to the pre-ACA barriers to the health coverage that helps them to manage the condition and reduce transmission. Even as the ACA remains largely intact, the administration has not only embraced abstinence-only education, but it has proposed a “gag rule” that limits Title X funding to providers who do not discuss abortion with their patients, despite clinics funded through Title X often being the sole source of HIV testing in rural and other underserved communities. Criminalization of drug-related offenses is also an important aspect of this story. The same day that Pence took action to allow a needle exchange program, he also upgraded possession of a syringe without a prescription and with intent to inject a controlled substance from a misdemeanor to a felony, with punishment of imprisonment of up to two-and-a-half years. Thus, while one may exchange dirty syringes for clean ones, it was still illegal to carry them. The Trump administration’s criminal justice policy likewise has prioritized drug prosecution, with the Department of Justice warning that those engaging in drug use—even when using safe injection sites—remain vulnerable to criminal penalties. Emphasizing that it is a federal crime under the Controlled Substances Act not only to use illicit drugs but to allow illicit drug use on one’s premises, the Department of Justice signaled a policy that would undermine communities’ ability to limit disease transmission through injection drug use amid the ongoing opioid crisis. Such emphasis on criminalization poses particular challenges for people of color, who are disproportionately penalized in the American criminal justice system. To be sure, politicians may shift their policy positions in the face of new evidence. Then-Gov. 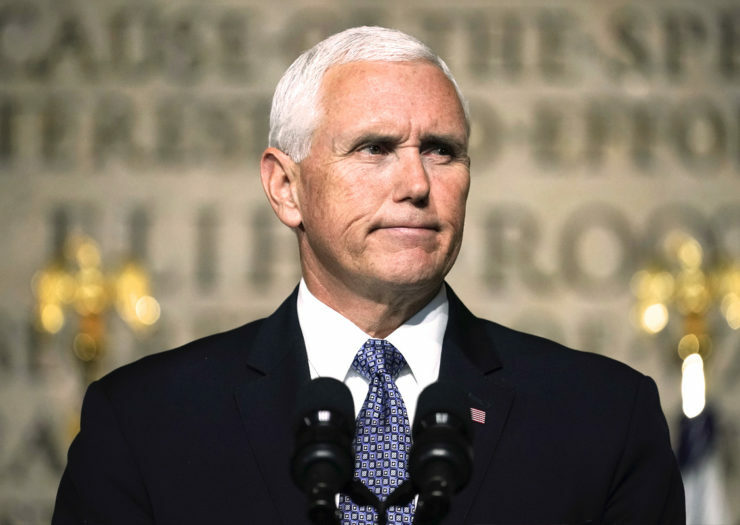 Pence observed the egregious public health impact of his funding cuts and rightly intervened amid the ensuing HIV crisis and mounting public pressure. However, Vice President Pence has supported legislation that would have eroded any progress made in his home state and beyond and imposed further roadblocks to health programs aimed at HIV prevention and treatment nationwide. And the president who is now professing a desire to end HIV by 2030 has championed domestic and international programs that call into question the sincerity of that commitment. Combating HIV transmission is a vital domestic and global public health objective that can and should transcend partisan agendas. But for the administration to go beyond a sound bite to actually meet success in this endeavor, it must confront seriously its broad array of conservative and counterproductive policy positions on drug treatment and on sexual and reproductive health.